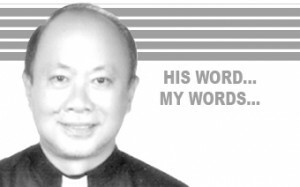 Brothers and Sisters, according to the words of Cardinal Tagle, â€œWe are an Easter people,â€ and what made us an Easter people is the ever-presence of Jesus in us in the Holy Spirit. Hence, there is always a need for us to make that power of the Holy Spirit always active in us by our participation in the mission of the Church. The sacred congregation at the celebration of the Mass is exercising the gifts of the Holy Spirit in us; hence, the different ministries at Mass starting with the priest as the presider at Mass, the altar servers, the lay ministers, the choir, the singing congregation, the lectors, the commentators, the collectors, the ministry of Ushers, and the rest of the ministries and the congregation are all propelled by the power of the Holy Spirit, the Advocate in the ministries of the Church. That is why the Mass is always a celebration, a celebration of LIFE. In the Bible, the Holy Spirit is always symbolized by a bird, usually a dove (e.g., at the Jordan baptism). Last March 14, 2013 (03.13.13 in Rome) the same Holy Spirit manifested Himself at the Sacred Conclave that elected Pope Francis. Archbishop Emeritus Oscar V. Cruz, D.D., in the NewsTV (GMA 7) â€œNews-to-goâ€¦Programâ€ interview, said he still believed that the presence of that bird, the â€œseagullâ€ on top of the chimney, after which the white smoke came out, is still the presence of the Holy Spirit in the Church today, now and forever. So God is really with us, God is at work in us, God is always â€œEmmanuelâ€ to us. This simply means that God has never abandoned us and His Church because of His ever-presence in the Church by the power of the Holy Spirit. The Church now ages 2,016 years and is still counting through all ages and generations.